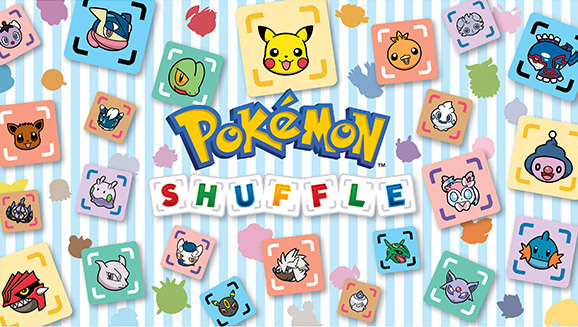 Pokemon Shuffle launched as a free-to-play title on the Nintendo 3DS eShop on February 18th, 2015 in most regions. It is a puzzle game similar to Bejeweled. The player must line up Pokemon in an attempt to defeat the opposing Pokemon. Just like main entries in the franchise - every Pokemon has a type it is strong against or weak against. Making consecutive matches allow the player to form combos, which increase the amount of damage done to the opposing Pokemon in any given turn. Once defeated - the opposing Pokemon is able to be caught. The catch rate depends on how well the player was able to complete the stage - usually by the amount of time or moves left after winning. The player is able to toss a Pokeball at the Pokemon after each successful battle. There are also Great Balls available for 2500 coins should the free Pokeball not be able to catch the Pokemon. The Great Balls will double the catch rate for a Pokemon.